Figure 19 Seafield Tower, Kirkcaldy. This stands on a 15 m thick sandstone. Beneath this lies a sequence of shales and limestones, in particular the Seafield Tower Limestone which forms the conspicuous pale ridge in the foreground. 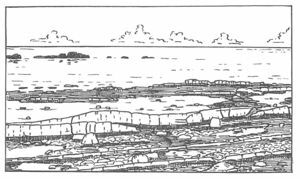 Figure 20 Minor thrusting in the Middle Kinniny Limestone, Seafield Shore, Kirkcaldy. Offshore the dark rocks, the East Vows, are poart of a dolerite sill. Walking distance 0.8 km of paths and 2.5 km on rocky shore. The main objectives of this excursion are to examine Carboniferous rocks belonging to (1) the Strathclyde Group, here predominantly basaltic lavas and tuffs with some interbedded sediments and of the order of 425 m thick (Francis 1961); (2) the Lower Limestone Formation (highest Dinantian) 146 m thick; and to a much lesser extent (3) the Limestone Coal Formation (Namurian). Intruded into these are (4) a teschenite sill which cuts the Lower Limestone Formation sediments and (5) a quartz-dolerite sill cutting the lowest sediments of the Limestone Coal Formation. Throughout the section the strata dip east at 20°–30° off the Burntisland Anticline and into the Fife Coalfield syncline. The lavas of the Strathclyde Group are probably related to a series of vents exposed in the vicinity of Burntisland and Aberdour a few kilometres to the west. Age dates on these lavas are around 330My (Francis 1991, p. 396), contemporary with the last stages of the Clyde Plateau Lavas and belonging to the late Visean. The outward journey is by B939 through Ceres to Craigrothie, then by A916 to Kennoway and Windygates. From here take the A915 to Kirkcaldy, along the promenade and by A921 to Kinghorn. In Kinghorn leave the bus at Lady-burn Place at the northern end of the town and send it back to the car park at the southern end of the Kirkcaldy promenade. The excursion is best undertaken on foot from Kinghorn to Kirkcaldy. Walk down Ladyburn Place, under the railway to join the footpath running between the railway and the caravan site and follow this northwards down to the shore to see the top of the Strathclyde Group succession which comprises a series of olivine-basalt lava flows, mainly of 'Dalmeny' and 'Hillhouse' types (Macgregor 1928, Upton 1982, p. 273), with intercalations of sandstone, ashy sandstone and muddy sandstone (fakes). The highest lava in this part of the section displays what Geikie (1900, p. 72) called pillow structure. This is a product of weathering and jointing rather than true pillows formed during eruption under water. Indeed some of the flows show a degree of subaerial weathering. In the lava there is a concentric arrangement of vesicles, together with a crude columnar structure normal to the top and bottom of the flow. The main part of the flow comprises hard, blue-grey, compact basalt passing up into a softer, greenish, amygdaloidal basalt, many of the vesicles containing calcite. Notice also, on a flat weathered surface at the eastern end of the basalts, veins of calcite following the joints and forming a hexagonal pattern. This rock may be seen on the western side of a small bay, readily identified from the path when approaching from Kinghorn by means of the pale grey limestone on its eastern side. Correlation of the First and the Second Abden Limestones with the succession in the Lower Limestone Formation elsewhere in Scotland has been controversial over the years. However, Wilson (1989, p. 104) has suggested that the Hurlet Limestone at the base of the Lower Limestone Formation is best correlated with the Second Abden Limestone and suggested further that the First and Second Abden Limestone may well be part of a single episode of limestone formation which was locally interrupted by eruption of the lavas which lie between them on the coast. Certainly the top of the thick lava of the Strathclyde Group lies immediately below the Second Abden Limestone in the shafts of the former Seafield Colliery some 2 km to the north and there is no trace of the First Abden Limestone there (Francis 1961, p. 17). A small N–S fault downthrowing to the west and repeating most of the succession should be examined where a small stream reaches HWM. Considerable fault drag of the strata can be seen. Next, the shales above and below the tuffs should be carefully examined as they are richly fossiliferous, yielding Productus, Aviculopecten, Sanguinolites, Murchisonia, ostracods, occasional Orthoceras and many other fossils. The shales above the graded tuffs have at their base a 2 cm yellow bentonite band. The shales interbedded in the limestones are also very fossiliferous as is the limestone itself, but in the latter the fossils are very difficult to extract and are better examined on the wave-washed surfaces. Foraminifera are common in thin sections of the limestone. Notice that the shale above the limestone is squeezed and contorted where the overlying basalt came into contact with it while it was still soft and water saturated. This shale has been selectively eroded out by the sea and forms a fissure at the foot of the lava cliff. Now return to the footpath and, keeping close to the shore, continue north, noting that the basalt lava flow above the limestone is quite massive. On top of this flow is a 1.2 m thick green tuff band now largely altered to a brick red laterite in which small pieces of decomposed lava can still be found. This laterite lies at the base of a prominent scarp formed by the next lava flow which is massive, doleritic and displays carious weathering along the joints. In all there are some 21 m of strata, mainly lavas, separating the two Abden Limestones (Francis 1961, p. 23). The pillow structure in the underlying basalt is best exposed at HWM. Green tuffs appear to have penetrated the cracks in the upper surface of the lava before covering it completely. On the shore the tuffs, red laterite and seatearth, have been preferentially eroded by the sea, but in the low cliff at HWM they form conspicuous coloured bands. The succeeding grey shales were described in detail by Ferguson (1962) who recognised from bottom to top the stages of a marine transgression, documented by the changing very abundant fauna. At the base will be seen the hard, 2.5 cm Naiadites crassa band in which many of these thick-shelled bivalves are found. The next 90 cm of shales yield in particular Lingula and Streblopteria. The next 75 cm yield Schizophoria and Productus and the topmost 60 cm, immediately beneath the limestone, yield Productus, corals and bryozoa. On the shore the Second Abden Limestone forms a prominent ridge which decreases in height when followed north. It consists of a series of limestone beds separated by irregular muddy partings. Considerable colonies of Lithostrotion junceum occur in it and solitary corals can also be seen, particularly on the wave-washed upper surface. Crinoid debris is abundant throughout. For the next 550 m the Second Abden Limestone strikes parallel to the shore but is cut by three small dip faults which displace the outcrop dextrally, in each case by a small down-throw to the south. At the first of these faults, 150 m north of the kilns, the limestone is brecciated, dolomitised, brown in colour and has a hematitic stain. At the second fault, 150 m further north, there is evidence of slight tear movement and again breccia is present. The third fault, lying just south of the prominent cliff of lava, cuts the limestone without appreciable brecciation. The footpath now skirts the western end of the cliff beside the railway line, then runs along the top of the cliff before descending to the shore beyond the headland formed by the lava cliff. (At low tide it is possible to pass the seaward end of the cliff.) The Second Abden Limestone, together with the beds beneath, should be carefully examined here and compared with the section seen at Locality 3; it will at once be noticed that the succession, which is tabulated below, is much thinner, principally on account of the tuffs beneath the limestone being much thinner. The metal footbridge on the path traverses an E–W fault line with slight brecciation in the lavas along which a cave has been opened up by the sea. The ridge on the shore formed by the Second Abden Limestone has also been breached, although the fault displacement is only about 1 m. Northward it will be seen that the Second Abden Limestone is overlain by 25 m of sandstones and shaly sandstones, within the outcrop of which the shore is crossed by a teschenite sill forming a small scarp on the shore. The sill margins are bleached and altered to white trap and the adjacent country rock has been baked. At the base of the sill at one location a set of tension gashes around 30 cm long and filled with calcite are exposed. The transgressive nature of the sill and its southward splitting are displayed on the shore. Notice the overlying white and pink sandstones which show good cross bedding and ripple marking. Interbedded seatearths contain abundant Stigmaria. They are succeeded by 3 m of grey shales which become shelly upwards and pass up into the Seafield Tower Limestone. 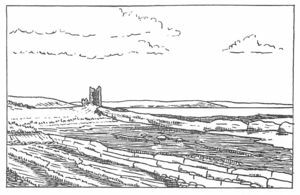 The Seafield Tower Limestone, at one time worked on the shore, crops out as a prominent pale grey band on the shore to the east of four old lime kilns, 250 m south of Seafield Tower. The limestone, which has three main beds, is 3.5 m thick and is succeeded by 14 m of calcareous grey shales with carbonate nodules and bands of crinoidal limestone up to lm thick. All these calcareous strata have been grouped together on the map as the Seafield Tower Limestone. Lithostrotion, Zaphrentis, Productus, Spirifer, Athyris, Schizophoria, crinoids and many other fossils can be found in these beds in considerable numbers. Forsyth (1970, p. 8) correlated the Seafield Tower Limestone with the Charlestown Main Limestone elsewhere in Fife, although Wilson (1966, p. 113) noted that the unique Neilson Shell Bed fauna, widespread elsewhere above the Charlestown Main Limestone and its equivalents, had not been located above any of the limestones of this section. In this succession the coaly beds are rarely exposed though the coal beneath the Lower Kinniny Limestone was at one time worked at outcrop. The Lower Kinniny Limestone is bioturbated, sandy and contains nodules up to 45 cm long by 15 cm thick. The Middle Kinniny Limestone is conspicuous on account of its being cut by several small thrusts which die out quickly in the shales above and below. It is richly fossiliferous in its upper, muddier part. The 1.4 m limestone above the Middle Kinniny Limestone also forms a prominent feature on the shore, especially towards Craigfoot, while the 12 m thick shale between these two limestones has been eroded out leaving an intervening depression. The 0.5m thick Upper Kinniny Limestone is impure, passes down into sandstone and thins northwards. It is stratigraphically important since it forms the topmost bed of the Lower Limestone Formation. Offshore the crags of Craigfoot and the East and West Vows are formed by dolerite sills intruded into the overlying Limestone Coal Formation sediments. From Craigfoot follow the Upper Kinniny Limestone north along the shore for 400m until the outcrop of the sill which forms Craigfoot is reached. The sill, which is 5m above the base of the Limestone Coal Formation, i.e. the top of the Upper Kinniny Limestone, here forms a scarp and is about 3m thick. The margins are bleached to white trap and are fine grained. Along this part of the shore it will be seen that the strike gradually swings round from N–S to NNW—SSE but the dip remains at 20°–25° eastward. Two hundred and thirty metres south of the bend in the old Tyrie breakwater some of the sandy beds beneath the Upper Kinniny Limestone have developed pseudo-nodules, through pods of sandstone sinking into the siltstone beneath while the sediments were still unconsolidated. Other thin-bedded sandstones in the vicinity display Scolicia type tracks across the bedding planes, generally thought to be made by gastropods. A small E–W fault with a downthrow of around 3 m can also be seen at this locality. Sixty-five metres south of the bend in the breakwater the quartz-dolerite sill that forms Craigfoot disappears under the sand. It reappears 27 m further north where a large brick pipe crosses the shore. Here too the sill margins can be seen to be fine grained and altered to white trap. A few metres north of the pipe a large raft of sandstone, now baked to quartzite and with its bedding perpendicular to the sill margins, is plainly visible in the sill. Now walk to the northern end of the breakwater where the coast section can be examined once more. The outcrops here are mainly of cross-bedded sandstones together with muddy sandstones and thin beds of shale with ironstone nodules, belonging to the Limestone Coal Formation. The quartzdolerite seen at the bend in the breakwater also crops out on its seaward side and is again altered to white trap. Continue along the shore to the car park to rejoin the bus and return to St Andrews. FERGUSON, L., 1962. The paleoecology of a Lower Carboniferous marine transgression. J. Paleont, 36,1090–1107. FORSYTH, I. H., 1970. Geological Survey boreholes in the Lower Carboniferous of West Fife.-Bull. Geol. Surv. G.B., 31, 1–18. FRANCIS, E. H., 1961. Economic Geology of the Fife Coalfields, Area II, Cowdenbeath and Central Fife. Mem. Geol. Surv. Scotland. FRANCIS, E. H., 1991. Carboniferous–Permian igneous rocks. In G. Y. Craig (Ed.) Geology of Scotland, pp. 393–420. Geological Sodety, London. GEIKIE, A., 1900. The geology of Central and Western Fife and Kinross. Mem. Geol. Surv. Gt. Br. MACGREGOR, A. G., 1928. 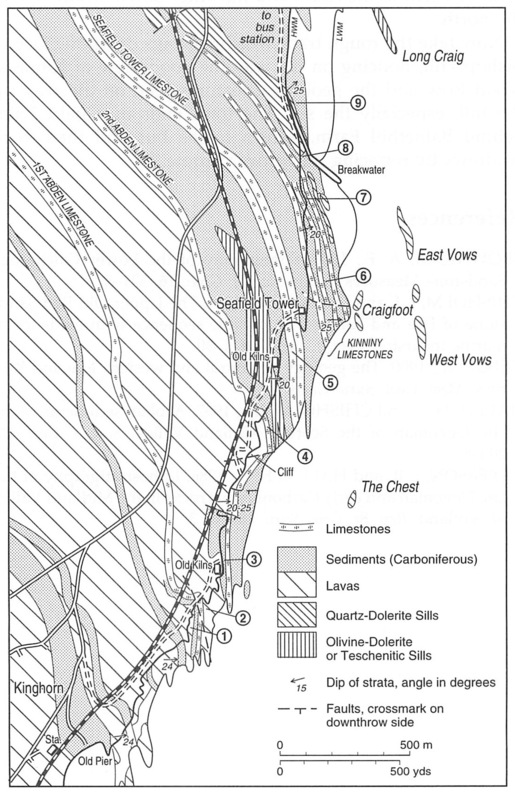 The Classification of the Scottish Carboniferous olivine-basalts and mugearites. Trans. Geol. Soc. Glasg. 18, 324–60. UPTON, B. J. G., 1982 Carboniferous to Permian volcanism in the stable foreland. In D. S. Sutherland, (ed.) Igneous rocks of the British Isles, pp. 255–75 Wiley-Interscience. WILSON R. B., 1966. A Study of the Neilson Shell Bed, a Scottish Lower Carboniferous marine shale. Bull. Geol. Surv. Gt. Br., 24, 105–30. WILSON R. B., 1989. A study of the Dinantian marine macrofossils of central Scotland. Trans. Roy. Soc. Edinb., Earth Sci., 80, 91–126. This page was last modified on 23 February 2019, at 16:34.